Shailesh Vara has expressed his disappointment that Stewart Jackson lost his seat as MP for Peterborough, but the Conservative politician said it was too early to say why his former Parliamentary colleague had been defeated. Mr Vara, who had little difficulty retaining his seat as MP for North West Cambridgeshire, said there will be plenty of time to figure out the reasons behind Mr Jackson’s political demise after he was surprisingly defeated at the General Election. 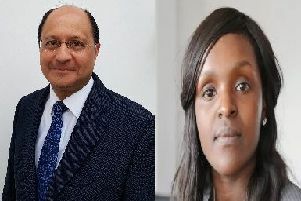 Conservative Mr Jackson’s 12 year tenure in Parliament was ended by Labour’s Fiona Onasanya who took Peterborough with a majority of just above 600. Mr Vara said: “I’m very, very disappointed about Stewart’s loss. Stewart is not only a colleague but a very good friend and I’m disappointed for him. Green Party candidate Fiona Radic said: “Thank you very much for your votes. I was astonished I got more than one tonight.